Philippe Sands is a distinguished, London-based international human rights lawyer who has written prolifically on international law, taught the subject at the university level, and handled human rights cases arising from Chile, Congo, Rwanda, and the ex-Yugoslavia, among others. He is also the grandson of Leon and Rita Buchholz, Jews who fled Vienna in the World War II era. Like many children and grandchildren of Jews who escaped Hitler’s clutches, Sands received little detail from his grandparents — or his parents — as he was growing up about the circumstances leading his grandparents and their infant daughter, Sands’ mother Ruth, out of Austria. 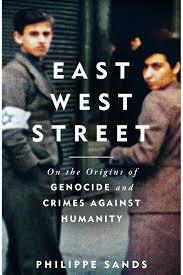 Uncovering these details is one of several threads running through this multifaceted work, East-West Street: On the Origins of ‘Genocide’ and ‘Crimes Against Humanity,’ a masterful blend of family memoir, Holocaust remembrance, and legal history. As his subtitle suggests, Sands’ work is also about the evolution of the legal concepts of “genocide” and “crimes against humanity,” today two pillars of international human rights law; and about the leading legal scholar behind each, Rafael Lemkin and Hersch Lauterpacht, respectively. The two scholars were at the forefront in the development of a powerful idea that began to take shape after World War I and assumed greater urgency as World War II unfolded and Nazi atrocities multiplied: that a strengthened international legal order was necessary where nation states and their key actors could be held accountable, thereby ending the notion that state sovereignty allowed a state to pursue any policy it chose toward its citizens. But from this common starting point, the solutions Lemkin and Lauterpacht pursued were almost polar opposites. Lemkin nearly singlehandedly came up with the notion of genocide as a term to describe state policies that single out persons for inhumane treatment because of their membership in a particular group. Lauterpach, rejected group membership as a basis for holding states accountable. Nation states and their actors, he countered, need to be held accountable for their inhumane treatment of individuals — for what he termed their crimes against humanity. Sands’ grandfather Leon Buchholz and the two legal scholars were Jews and roughly contemporaries, with links to the same city, Lviv, today part of Western Ukraine. Buchholz was born there in 1904. Lauterpacht, born in nearby Zółkiew in 1897, moved to Lviv with his family in 1911 and studied law there. Lemkin, born in 1900 on a farm at some distance from Lviv, moved to the city in 1921 to study law (East-West Street, Sands’ title, refers to a street in Zółkiew where Lauterpacht and Buchholz’s mother lived for a time, on opposite ends). Lviv itself plays a major role in Sands’ story. Today’s Lviv reflects the upheavals of the 20th century. When the three young men were growing up prior to World War I, the city was known as Lemberg. It was the largest city in Galacia, a province within the Austro-Hungarian (or Hapsburg) Empire, and a vibrant melting pot of Poles, Ukrainians, Jews and others. After World War I, the city became part of a newly independent Polish state and was known as Lwów. The three young men acquired Polish citizenship at that time. The Soviet Union occupied the city at the outbreak of World War II, in the aftermath of the secret 1939 protocol between Nazi Germany and the Soviet Union partitioning Poland (the subject of Roger Moorehouse’s Devils’ Alliance, reviewed here in May 2016). In 1941, Germany retook the city from the Soviets, who in turn drove the Germans out in 1944. The city then became part of Ukraine and the Soviet Union and assumed its present name. It became part of an independent Ukraine with the collapse of the Soviet Union in 1991. None of the three men was present in Lviv during World War II, but their war experiences were similar in one grim respect: each lost parents and most other family members left behind during the German occupation. Those loses can be traced in no small measure to Hans Frank, a genuine villain whom Sands adds to his story of the three Jewish men from Lviv. Frank, born in Germany in 1900, the same year as Lemkin, was Adolph Hitler’s personal lawyer and a German legal scholar of some stature who fashioned many of the Nazis’ idiosyncratic legal theories – theories that, in opposition to those of Lemkin and Lauterpacht, subordinated the individual to an all-powerful state and emphasized the inviolability of state sovereignty. Frank became governor of German-controlled Poland after the 1939 Nazi invasion that triggered World War II, and his authority was extended to Lviv in 1941, when the Nazis dislodged the Soviet Union from the city. As German governor, Frank oversaw the decimation of thriving Jewish communities across Poland, including that of Lviv, and crafted the policies that destroyed the three men’s families. With the defeat of Nazi Germany in 1945, Lauterpacht, Lemkin and Frank and the legal theories they espoused met head on at the International Military Tribunal in Nuremberg. Frank was one of 24 high level Nazi officials placed on trial for his role in atrocities committed by the Nazi regime. Behind the scenes, Lemkin and Lauterpact competed to define the terms of the prosecution and judgment, with each lobbying to have the tribunal’s judges and prosecutors adopt his legal principle as a basis for prosecution – genocide for Lemkin, crimes against humanity for Lauterpacht — and reject that of the other. But one point was clear from the outset of the proceedings: Frank’s expansive notion of state sovereignty was categorically rejected — states were no longer free to treat their people entirely as they wished; state sovereignty no longer constituted an absolute bar to prosecution for acts of atrocity. But Sands starts and finishes with his family portrait, the story of his grandfather Leon, his wife Rita and their young daughter Ruth, Sands’ mother, uncovering details of their lives in those turbulent times which they chose not to reveal to the future human rights lawyer as he grew up in Great Britain. Throughout, Sands himself is very much part of his story, which jumps between past and present as he explains how he pieced together his narrative’s disparate threads. Among his sources are several still living individuals related to the central characters in the story, including the sons of Lauterpacht and Frank. Sands thus packs a lot into just less than 400 pages. Sands explains at the outset that his motivation for writing this book stems from mysteries surrounding the life of his grandfather Leon, a man he clearly loved yet found he hardly knew. For the most part, Sands writes, Leon “locked the first half of his life into a crypt” (p.xxv). Sands came to know Leon in the 1960s when, as a young boy, he visited the Paris apartment where Leon and his wife Rita lived. Intuitively, the young Sands, born in 1960, came to realize that Leon and Rita’s time before Paris was not to be talked about. It’s too complicated and not important, Leon told his grandson. But as he sought to uncover the circumstances that led his grandparents and mother from Vienna to Paris, he pieced together many additional details of their prior life. Leon was the youngest of four children. His older brother was killed in World War I just after its outbreak, in September 1914, and his grieving father died shortly thereafter. Leon had two sisters, Gusta and Laura. Gusta married in 1913 and moved to Vienna. Leon’s mother Malke took Leon and Laura to Vienna to be with Gusta, where young Leon attended primary and secondary school. 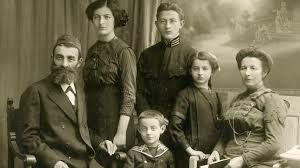 A few years later, Leon and Laura returned with their mother to Lviv. Leon left the city definitively at age 19, in 1923, after it had become part of Poland, to make his way in Vienna. Gusta, Laura, and Malke all subsequently died in the Holocaust, along with Laura’s daughter. In Vienna, Leon worked for a while at the liquor store of his brother-in-law, then set up his own distillery. He met his future wife, Rita Landes, in Vienna, and they married there in 1937. Their daughter Ruth, Sands’ mother, was born one year later, just prior to the German Anchluss with Austria in 1938. Growing up, Sands had assumed that his mother’s family had all left Vienna at the same time, but he learned that this was far from the case. Leon was expelled from Vienna in late 1938, in the aftermath of the spasm of anti-Jewish violence known as Kristallnacht, and arrived alone in Paris in January 1939. Rita stayed behind, ostensibly to care for her ailing mother. She did not leave Austria until November 9, 1941. The very next day “‘the borders of the German Reich were closed for refugees,’ all emigration ended, all departure routes were blocked. Rita got out at the last minute. Her escape was either very fortunate or based on assistance from someone with inside information” (p.39). The details of Rita’s departure eluded Sands, but an even greater mystery bedeviled him. The passport of his mother Ruth indicated that she arrived in Paris in July 1939, near her first birthday. How did the one year old get to Paris in July 1939 if Leon had been there since January of that year and Rita stayed in Vienna until 1941? The evidence pointed to a Miss Elsie Tilney, the most remarkable of the many supporting characters in this story. Sands learned that Miss Tilney was an heroic Christian missionary who spent the dark Nazi era escorting Jews, particularly Jewish children, to safer locations, and that Ruth had traveled to Paris with Ms. Tilney. He further learned that the 11-year old daughter of Leon’s sister Laura was to have traveled to Paris with Miss Tilney and Ruth, but that Laura changed her mind at last minute, because she couldn’t face the separation. Neither mother nor daughter survived the war. In the process of uncovering these details about the departures from Vienna, Sands also stumbled across evidence he had not be looking for, suggesting a substantial rift between his grandparents: his grandmother may have had an affair with another man, which may or may not have been part of the reason Leon traveled alone to Paris in 1939. Sands further came across suggestions that his grandfather too may have been attracted to another man. Sands’ narrative assumes a spell-binding quality as he weighs the limited evidence available and comes closer to a fuller picture of how his grandparents and their daughter escaped Vienna and survived the war, while most of the rest of the family perished. Into this close-to-home family history, Sands adds not just the legal theories but also much personal detail about the lives of legal scholars Lemkin and Lauterpacht. Like Buchholz, Lauterpacht found his way to Vienna as a young man, in 1919. After beginning the study of law at the university in Lviv, Lauterpacht continued his legal studies in Vienna, where he reflected upon how the upheavals of the post-World War I era might be avoided in the future. When a wave of anti-Semitism swept Vienna in 1923, he emigrated to Britain, where he first studied, then taught at the London School of Economics, followed by an appointment to Cambridge University in 1937. Lemkin studied law and linguistics at the same university in Lviv a few years after Lauterpacht, where he had the same criminal law instructor who had previously taught Lauterpacht. Lemkin became a public prosecutor in Warsaw, while publishing extensively on international criminal law. He escaped from Poland after the Germans invaded the country in 1939, ending a circuitous journey at Duke University in North Carolina, where he taught law for many years. Against the backdrop of the two men’s personal lives, Sands zeroes in on the evolution of the legal thinking that began to take form for both in Lviv and blossomed in academic settings in the United Kingdom and the United States. Lemkin and Lauterpacht shared an optimistic belief in the “power of law to do good and protect people,” and the “need to change the law to achieve that objective,” Sands writes. “Both agreed on the value of a single human life and on the importance of being part of the community” (p.385). But their solutions pointed in opposite directions. Lemkin “imagined new rules to protect ‘the life of the peoples’: to prevent ‘barbarity’, the destruction of groups, and to prevent ‘vandalism,’ attacks on culture and heritage” (p.157). Although not opposed to individual rights, Lemkin believed that an “excessive focus on individuals was naïve, that it ignored the reality of conflict and violence: individuals were targeted because they were members of a particular group, not because of their individual qualities” (p. 291). Lemkin advanced his notion of genocide in a 1944 book, Axis Rule in Occupied Europe, which Lauterpacht reviewed in the Cambridge Law Journal in a “detached and lukewarm” (p.107) tone. To Lauterpacht, Lemkin’s notion of genocide and its emphasis upon group membership seemed likely to “reinforce latent instincts of tribalism, perhaps enhancing the sense of ‘us’ and ‘them,’ pitting one group against another” (p.281). Lauterpacht sought to diminish the force of inter-group conflict. The emerging international legal order needed to protect each individual, “irrespective of which group he or she happened to belong to, to limit the potent force of tribalism, not reinforce it” (p.291). In the contest between competing legal theories at Nuremberg, Lauterpacht was the immediate winner. His ideas on crimes against humanity and the rights of the individual were “firmly entrenched in the proceedings, coloring the entire case” (p.353). The term “genocide” was by contrast barely mentioned. Both men attended substantial portions of the proceedings, which took place between November 1945 and October 1946, during which both learned that their parents and several family members had not survived the war. In this time frame, Leon Buchholz also most likely learned that his family members left behind in Lviv had met the same fate. Lauterpacht exchanged ideas on how to frame the Nuremberg indictment with American chief prosecutor Robert Jackson. But as the proceedings progressed, he exerted an even more direct influence upon British prosecutor Sir Hartley Shawcross. In his opening argument on December 4, 1945, Shawcross adopted wording Lauterpacht had proposed, “arguing forcefully that the tribunal should sweep aside the tradition that sovereigns could act as they wished, free to kill, main and torture their own people” (p.292). The core of Shawcross’ argument came straight from Lauterpact: “The state is not an abstract entity. . . Its rights and duties are the rights and duties of men.” Shawcross thus put a radical spin on the idea of individual responsibility by “placing ‘fundamental human rights’ and ‘fundamental human duties’ at the heart of a new international system” (p.292-93). The prosecution’s case against Hans Frank at Nuremberg brought German actions in Lviv and Poland to center stage in the proceedings. In drafts that Lauterpacht had provided to Shawcross, Frank was the only defendant Lautherpacht mentioned, and he did so repeatedly — no coincidence, Sands writes, given that Frank was the “man in the dock most closely connected to the murder of his own family” (p.339). While governor of Poland, Frank had kept a detailed and highly incriminating diary of his daily activities, which had fallen into allied hands as the war ended, giving him little room to maneuver. As Frank initially faced the tribunal in March 1946, Sands speculates that his lawyer had no sense what his client might say. When the lawyer asked Frank at the outset whether he had participated in the annihilation of Jews in Poland, the former governor astounded the Nuremberg court and his fellow defendants by responding, “yes,” adding that his conscience did not permit him to throw responsibility for the slaughters upon what he termed “minor people.” One thousand years will pass, Frank told the court, “and still this guilt of Germany will not have been erased” (p.310). But Frank’s lawyer appeared to walk back this confession in his closing argument the following July. His client’s diaries were the thoughts of the secretaries who transcribed them, Frank’s lawyer contended. His client had never killed anyone, and he had tried to mitigate some of the most atrocious excesses of the regime. Most likely, the other defendants and their lawyers had in the time since March impressed upon Frank and his lawyer the need for solidarity among the defendants, and convinced them to reverse course. The arguments proved to be of no avail. Frank was condemned to death by hanging and became the fifth Nazi official to go to the gallows. 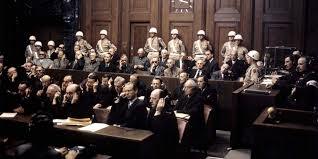 The judgments at Nuremberg “came as a relief to Lauterpacht.” His arguments on crimes against humanity, endorsed by the tribunal, were “now part of international law. The protection for the individual, and the idea of individual criminal responsibility for the worst crimes, would be part of the new legal order. The sovereignty of the state would no longer provide absolute refuge for crimes on such a scale, in theory at least” (p.372). But if he felt any satisfaction with the judgment, he never mentioned it to anyone. Lemkin by contrast was devastated by absence of any mention of genocide in the court’s final judgments. This “Nuremberg nightmare” (p.372) was the worst day of his life, he told an American junior prosecutor, worse even than the day a month earlier when he learned that both his parents had perished in the Holocaust. But genocide gained traction as a recognized concept in international law in December 1946, when the United Nations General Assembly adopted a resolution that affirmed that genocide, which denied the “right of existence of entire human groups,” was a crime under international law. Where the judges at Nuremberg had feared to tread, Sands notes, governments working through the United Nations “legislated into existence a rule to reflect Lemkin’s work” (p.377). Two years later, in December 1948, the General Assembly adopted the Convention on the Prevention and Punishment of the Crime of Genocide, the first human rights treaty of the modern era. One day later, the General Assembly also adopted the Universal Declaration of Human Rights, for which Lauterpacht was a primary inspiration. Much of the vibrancy of Sand’s story comes from his resourcefulness in finding living persons to supplement the meager record of writings and photographs with oral recollections of the story’s central characters, especially the sons of Lauterpacht and Frank, Eli and Niklas. Eli (officially Sir Elihu), born in London in 1928, followed in his father’s footsteps as an academic and lawyer specializing in international law, founding Cambridge’s Lauterpacht Centre for International Law. Sands first met Eli when he took Eli’s course in international law at Cambridge in the 1980s. But it was not until several decades later that Sands learned of the Lviv connection between Eli’s father and Leon Buchholz. Eli told Sands that as he grew up in Britain his father, like Leon, never talked about life in Poland (Eli died in 2017, after Sands’ book went to press). Niklas Frank, born in 1939, became a distinguished journalist as a foreign correspondent for Stern Magazine. The younger Frank came to Sands’ attention for a book he had written in the 1980s called Der Vater (The Father), an “unforgiving, merciless attack on his father, a work that broke a taboo that directed the children of senior Nazis to honor their parents” (p.224). On one occasion, Niklas told Sands, “My father loved the Führer more than he loved his family” (p.235). Sands and Niklas visited the Nuremberg tribunal together in 2014. “My father was a lawyer; he knew what he did” (p.xxiii), Frank told Sands at the time. The major threads of Sands’ book – his family’s exodus out of Vienna in the Nazi era; the clash of ideas between Lauterpacht and Lemkin for a new legal order that played out at Nuremberg; and the vicissitudes of Lviv – illuminate, each in its own way, the travails of Europe’s 20th century and their on-going consequences. Each would surely merit treatment in a separate work. Readers contemplating investing time in Sands’ book may ask themselves whether these disparate threads can be wrapped together coherently into an absorbing narrative. My answer upon concluding this epic work was that Sands has accomplished precisely that.